In Drafting Appellate Briefs, Step 1 is Know the Audience (Appellate Brief Series, Part 1), Massachusetts Lawyers Weekly (2014). Learn how to draft a more effective and successful appellate brief by keeping in mind the unique concerns and expectations of Appeals Court justices. 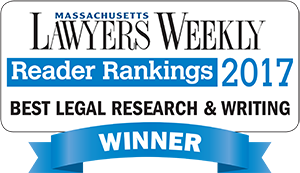 Steps to Take Before You Write (Appellate Brief Series, Part 2), Massachusetts Lawyers Weekly (2014). Learn how advance preparation pays big dividends when drafting an appellate brief. Writing a Brief? Know the Technical Requirements (Appellate Brief Series, Part 3), Massachusetts Lawyers Weekly (2014). Learn about the technical requirements for a Massachusetts appellate brief, including required sections, certifications, organization, formatting and filing. Get Off to a Good Start With a Strong Statement of Issues (Appellate Brief Series, part 4), Massachusetts Lawyers Weekly (2014). A carefully drafted statement of issues is critical to the success of your appellate brief. Follow the Statement of Issues With a Strong Statement of the Case (Appellate Brief Series Part 5), Massachusetts Lawyers Weekly (2015). Your Massachusetts appellate brief should have a strong Statement of the Case, establishing your credibility, telling a compelling story, and supporting your legal positions. A Persuasive Argument Requires an Effective Argument Section (Appellate Brief Series Part 6), Massachusetts Lawyers Weekly (2015). Learn how to draft a convincing and persuasive argument section for your Massachusetts appellate brief. It may be your only chance to present your legal positions. More on the Effective “Argument” Section (Appellate Brief Series Part 7), Massachusetts Lawyers Weekly (2015). Learn more about drafting an effective “Argument” section for your Massachusetts appellate brief. It’s your best chance to present your legal positions.